It is crucial to ensure that women's voices are heard and women leaders are fully engaged on policy decisions. At WFPG, we advance women's leadership and highlight their contributions through international issues and mentoring programs. WFPG convenes professionals from across disciplines and broadens the constituency for international affairs. Substantive internships are available year-round and early applications are encouraged. Meet our interns! WFPG provides a wonderful introduction to office work, foreign policy, and Washington, DC...The opportunity to work as a Jack-of-all-trades' intern and learn different tasks and skills is one of the strongest aspects of this internship. WFPG is looking for three responsible and motivated interns to focus on planning and outreach for programs featuring international affairs officials and experts. In addition to assisting with our Author and Embassy Series programs, interns also contribute to Celebrating Women Leaders Benefit Luncheons. Interns will also research foreign policy topics before events, assist in media outreach and the production of our newsletter, update the WFPG database and webpage, and complete other office tasks as assigned. Applicants must be available to work a minimum of two full days per week. WFPG is also looking for a specialized intern to focus on the production of WFPG newsletter and communication materials, media outreach, and webpage design/updates in addition to research and other general office duties. 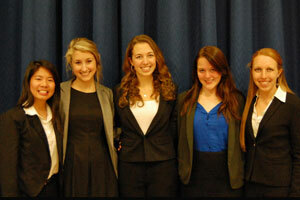 Communications interns also assist in production of materials for major fundraisers and update the WFPG brochure. Applicants must be available to work a minimum of two full days per week. Exposure to mid and senior-level professionals from across the international affairs field. Opportunities to learn more about international issues, leadership development and the operations of a small nonprofit. WFPG events and co-sponsored events are a great opportunity to get a feel for the way international issues are discussed, and to mingle with past and current women leaders. 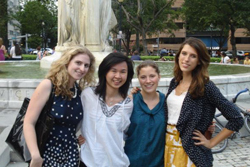 WFPG interns also have the privilege to attend other events in DC at the State Department, think tanks, and embassies. Part-time internships are unpaid or for college credit. Full-time interns who commit to 3.5 months (15 weeks) during the school year or 3 months (13 weeks) during the summer are eligible for a $1,000 stipend upon completion of the internship. Our internship program is only open to US citizens and permanent residents or students who are eligible to work in the United States. We are unable to sponsor visas. Applicants under consideration will be contacted for an interview. The Women’s Foreign Policy Group is seeking a dedicated and motivated individual to join our team. The Program Assistant assists the Executive Director in all aspects of the WFPG’s operations including program planning, outreach, administration, and fundraising. The position requires a diligent self-starter with a strong background in international affairs, who is well-organized and possesses excellent oral and written communication and computer skills. Candidates must be detail-oriented, flexible, and comfortable in a small active organization which requires multi-tasking, independence, and teamwork. This is an entry-level position with extensive responsibility. Since its founding over 20 years ago, the Women’s Foreign Policy Group has been committed to promoting women’s leadership and voices in international affairs through our in-depth global issues programming and mentoring activities. A key player in broadening the constituency for international affairs, WFPG brings together participants from across disciplines and links women domestically and internationally. We believe that through highlighting women leaders in foreign policy, we provide important role models for the next generation and create a vital network of women from different sectors, generations, and backgrounds. Strong interpersonal skills with the ability to work effectively with a wide range of individuals Articulate, professional and able to communicate in a clear, positive manner with members and staff. Proficiency with MS Office Suite and Google Drive. Experience with QuickBooks or other accounting software preferred. Salary: $36,000-$40,000, depending on experience. APPLY ONLINE In addition to your resume and coverletter, the application form requests an unofficial transcript (if you graduated in the last three years), contact information for three references, and several questions about your background and experience. Please direct any questions to [email protected] Applicants under consideration will be contacted for an interview.